Our ultra creamy S’MORES CHEESECAKE with it’s thick, buttery graham cracker crust, layer of chocolate ganache & toasted marshmallow frosting is the stuff dreams are made of! So I’m always looking for new, creative recipes to serve to my family around the holidays, but this year at Christmas I was totally stumped. Everyone is so mixed about peppermint (ummm…I don’t get it because peppermint is perfection), and after like 7 gingerbread recipes, I think they might have been kinda over it. Thanksgiving is easy, but I always have the most difficult time figuring out what the heck to make for dessert on Christmas. So…this year I just decided to do something different, and not Christmasy, and just combine two of my favorite things: s’mores and cheesecake. Because…how could that not be amazing? Umm, it was. Amazing. Everyone was asking for 2nds and to go bags and I was trying to hoard all the leftovers for myself. Actually, it was kind of a problem. For my waist line. 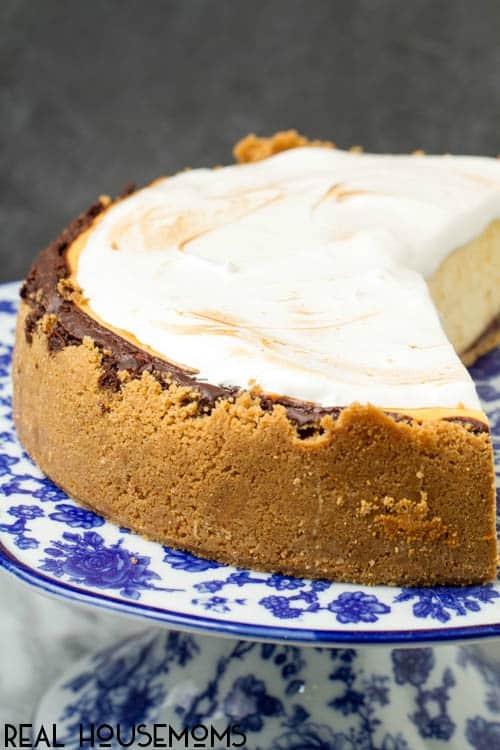 The perfectly thick, buttery graham cracker crust is topped by a thick layer of chocolate ganache, then a traditional cheesecake and finished off with a toasted marshmallow frosting. You guys…it’s heaven. Regular cheesecake will never do the trick again. Sorry, not sorry. The good news? 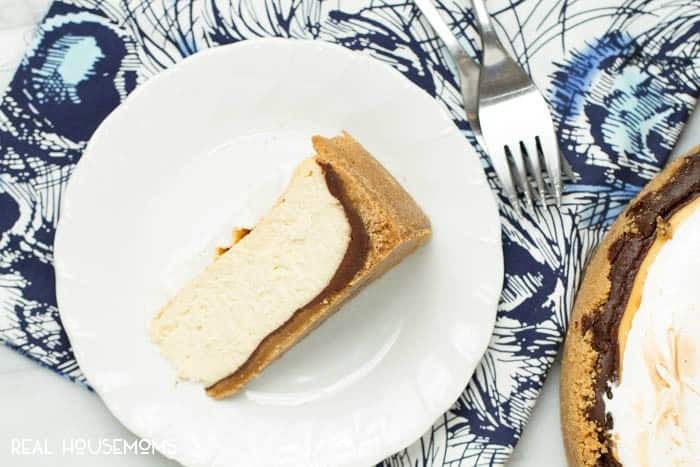 It’s really not any more time consuming than a traditional cheesecake. The marshmallow topping takes a whopping 7ish minutes, and everything else is pretty standard. Aaaaannndd, no water bath required! Even if you have some cracking at the top, just cover that ish up with the marshmallow topping and you’re good to go! Our ultra creamy S'MORES CHEESECAKE with it's thick, buttery graham cracker crust, layer of chocolate ganache & toasted marshmallow frosting is the stuff dreams are made of! Preheat oven to 325. Spray a 9" springform pan with nonstick spray. Set aside. Combine graham cracker crumbs and sugar in a large bowl. Slowly add butter until crust is desired consistency - it should hold together, but not be soupy from too much butter. Press crust into the bottom of your springform pan. I also pressed mine all the way up the sides. You can make a super thick bottom crust, or also have it go up the sides - your choice. Heat chocolate and cream over a double broiler (or create your own by bringing about 2 inches of water to a simmer in a medium pot and placing a large heatproof bowl on top). Stir constantly until chocolate is fully melted. Remove from heat and let cool just slightly so it thickens just a touch, about 3-5 minutes. Pour ganache over prepared crust. Beat cream cheese and sugar until smooth. Add eggs one at a time until each is fully combined. Add vanilla. Pour cheesecake mixture over prepared crust and bake until just set, about 50-60 minutes. There should be no jiggle left to the cheesecake, and when you press lightly on the top, it should easily come back up. Cool completely then refrigerate for at least 4 hours or up to overnight. Either use a double broiler, or create your own by bringing about 2 inches of water to a simmer in a medium pot and placing a large heatproof bowl on top. Whisk egg whites, sugar and cream of tartar constantly until sugar is completely dissolved. Transfer to stand mixer with the whisk attachment. Beat on low and gradually increase speed to high, beating until stiff peaks form. The frosting should stand on the whisk attachment when removed. Generously spread frosting over your cheesecake. Torch with a kitchen torch if desired, and serve. 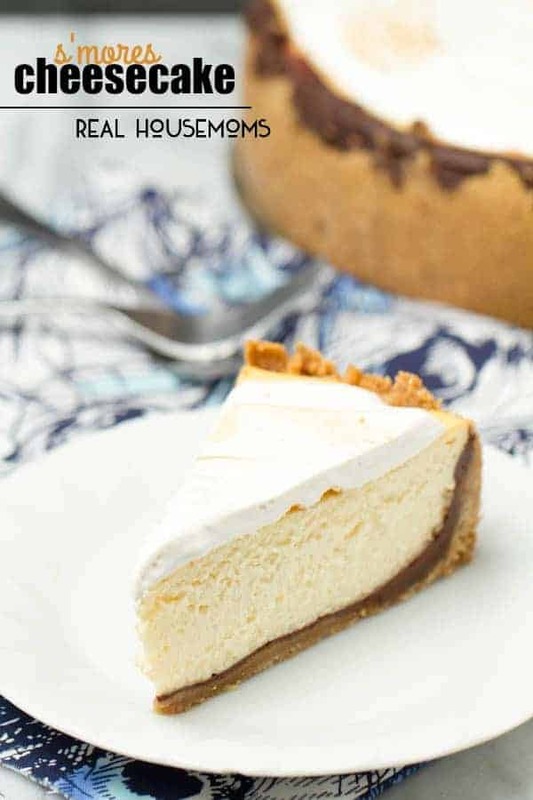 Leftovers may be refrigerated for 3-5 days, although the frosting does not stay as well as the cake, so if you know you will have leftovers, I recommend just frosting the pieces you are eating, then storing cheesecake and frosting separately.